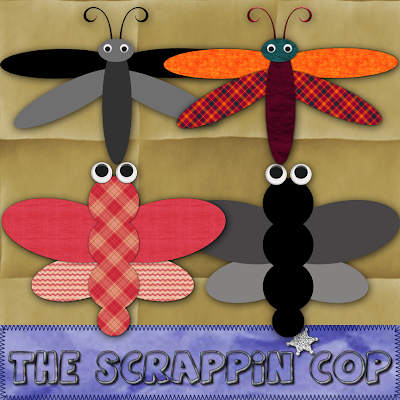 The Scrappin Cop: CU Layered Templates - The Dragonflies! CU Layered Templates - The Dragonflies! Whew, I actually got something done today besides designing today's freebies! My DH told me when I came home for lunch today that his mother and father are coming this evening. UGH! My house was a complete mess. So as soon as I got home from work I vacuumed and dusted and scrubbed my house so that they wouldn't think a bunch of piggies live here. Then my DH stops by for his dinner (he works 2nd shift, I work 1st) and tells me that he was mistaken, they aren't coming over tonight. So I guess I should be thankful that at least my house got cleaned, even if our guests didn't come. While at work today I happened to do a walking beat at Hobby Lobby. 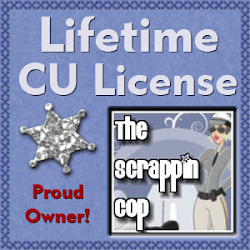 Don't laugh, our bosses encourage "community policing" and so I check out my favorite craft stores for the latest finds. And I found some adorable little bug stickers that I thought I could scraplift into templates for you. Now, as you know - I can't draw. But luckily PSE knows how to draw circles and ovals and I can arrange those to make something that looks like dragonflies. The stickers had "googly eyes" and I first thought about buying some and photographing them in my ghetto light box but I decided instead to try and make them in PSE. And I think my "eye" turned out pretty good! I will finish up in tomorrows post with the other critters but here are the dragonflies! The download .zip includes .PSD files for each dragonfly and .png parts for each so they should work for everyone. I also included the example dragonflies in the preview image if you would like to see what they look like when finished. 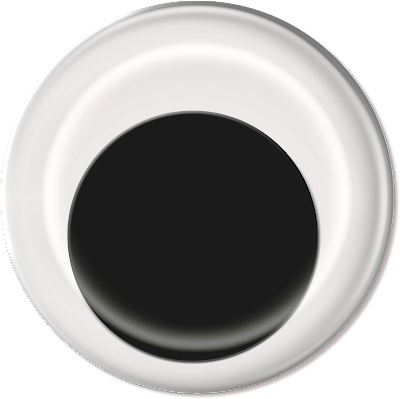 And just in case, for whatever reason, you would happen to want a googly eye to use in your designs I am sharing that too! LOL. Love them both - thanks! These are so Cute!!! Thankx so much Deb!! Thank you! Your blog post will be advertised on the DigiFree Digital Scrapbooking Freebie search engine today (look for timestamp: 19 Jul [LA 01:03am, NY 03:03am, UK 08:03am, OZ 06:03pm]). These are just too cute! Thanks so much! 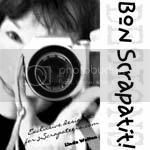 Well HELLO - this is MY FIRST visit to your blog too, thanks for stopping in on me. I think your creations are lovely too! I'm leaving my commment/thanks here for you, rather than 4shared. I FOR SURE will use your CU Flowers! I hope to visit you in the future & wish you the best for your wonderful creations. These are great. Thank you for sharing! Loving Ann from The Chicken Coop for letting me know about your blog. Thanks Deb! These are cute! Love the Googly Eye! Deb - I must say a huge thanks. I don't have a project just at the moment which requires these, but i KNOW you are going to be saving my bacon at some point in the future. THANK YOU so much for your generosity, time and talent! These are sooo AWESOME and couldn't have come along at a more perfect time ;) Thank YOU! You are extremely talented and very generous with your talent-thanks so much! Don't think I'm paranoid... but I think someTHING on this blog has got it's BIG EYE on me!!! 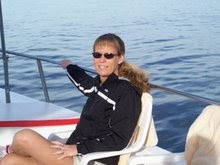 Deb, you are a TOTAL hoot girl and the MOST entertaining COP scrappin' wise and for REAL that I've EVER met!!! That ought to tell you something right there! I've been a good girl for the FIRST "54" years of my life!!! ROFL!!! Thank you SO much for some more of your INCREDIBLE goodies. Oh, I about fell off my chair with the GHETTO LIGHTBOX!!! And, I'd like to make one of those too! ou're a life saver. I was just looking for a dragonfly for my latest kit. THANK YOU!